Two people were killed and six injured in a stabbing attack in the Finnish city of Turku Friday, authorities said. Police shot and wounded the suspect who is now being treated in hospital. It's yet unclear if the incident is related to terrorism. The stabbing incident took place at 4:02pm local time when a knife-wielding man attacked eight people in downtown Turku, according to General Markus Laine, Commissar of the Crime Commission. The suspect was shot in the lower body and arrested by police minutes later. The attacker is being treated in hospital, with police being unable to question him yet. “The perpetrator has been shot in the leg and had been detained by the Finish police,” a local journalist, Attila Cser, told RT. Out of eight people injured in the incident, two have since died, the Central Bureau of Investigations said. The director of Turku University Hospital, where the victims and the attacker are being treated, said all of the victims were adults. 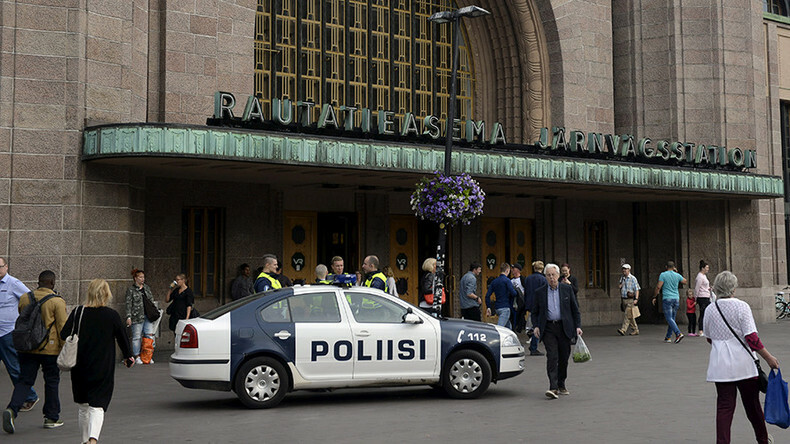 The Central Bureau of Investigations, which has taken over the investigation from the Turku police department, reported that several people have been brought in for questioning in connection with the Turku attack. Police said the incident was not being investigated as a terror attack. This could change, however, should new evidence come to light. The security intelligence police (Supo) are also involved in the investigation. “We are working internationally with Europol and other countries” as part of the investigation, Laine said. A video posted online appears to show the moments after the incident. People are seen running down the street with shouting heard in the background. The tweet claims there were shouts of “Allahu Akbar” and that it is a terrorist attack. Police “have not confirmed” media reports that the attacker was shouting “Allahu Akbar” at the time of the assault, Cser told RT. The probe is currently focusing on determining the motive of the attacker, with police anxious to question him once his medical condition improves. Authorities are now examining surveillance footage from the scene of the attack to verify if the assailant acted alone. Security will be reinforced nationwide after the stabbing. Additional patrols will be deployed and surveillance boosted across Finland, police said. The attack comes just a day after a man plowed a van into pedestrians on a popular tourist street in Barcelona, killing 13 people and injuring more than 100 others. Hours later, terrorists launched a second attack in the seaside town of Cambrils, injuring seven people, one of whom later died. Police killed five terrorist cell members and detained four suspects believed to be behind the attacks. At least one remains at large. A number of stabbing attacks have taken place across Europe in recent months. In late July, a knife-wielding man shouting “Allahu Akbar” attacked police on the Spanish-Moroccan border, injuring an officer. The suspect was immediately arrested. That same month, an asylum seeker went on a stabbing spree at a supermarket in the German city of Hamburg, killing one person and injuring several others. Hamburg State interior minister Andy Grote said the man was known to authorities as a radicalized Islamist. Earlier in June, an attack on London Bridge saw terrorists stab people at Borough Market after plowing into pedestrians with their vehicle.